Creating a better place with Brilliant Bikes: Which sprocket(s) do I need for my Brompton? 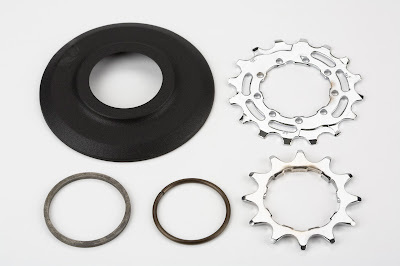 Which sprocket(s) do I need for my Brompton? Over time chains and sprockets wear out. Due to the workhorse nature of the Brompton and the fact that the drivetrain is closer to the ground than on larger bikes (it picks up more dirt / grit), and the fact that it only has one or two sprockets to pared to 7-11 on a mountain bike for example, they can wear even quicker. If you are replacing your rear sprocket(s) then we recommend replacing both the chain and the sprocket. We describe it as an old married couple - they get comfortable with each other and wear at about the same rate. So remember - if you replace the chain alone then the chain may well slip - and the same if you replace just the chain. Which sprocket(s) do I need? Well, as you are changing the chain AND sprocket, then it's the 3/32 sprocket you'll be wanting! Note: If you fit a narrow chain 3/32 to a wide sprocket 1/8, the chain may not sit properly on the sprocket - so the chain will appear to be too short. 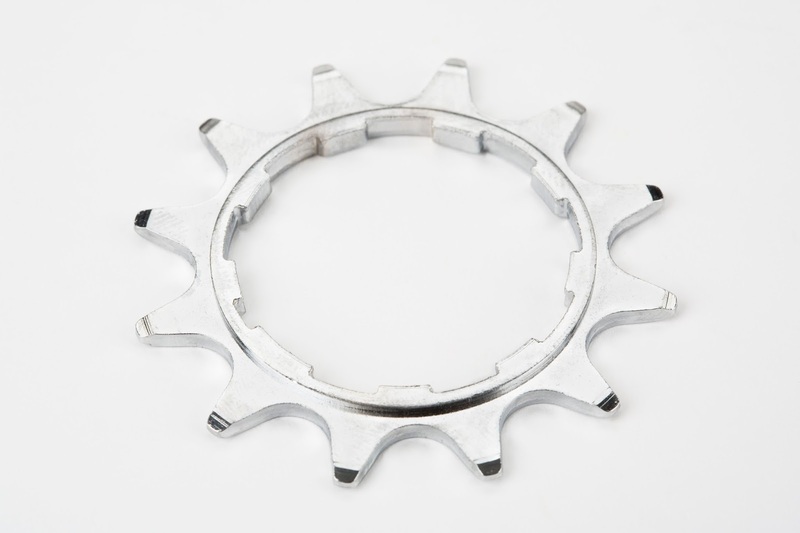 The sprocket you need depends upon your rear wheel and on whether you also want to replace the chain guard and circlip (which holds the sprocket / sprockets) in place. 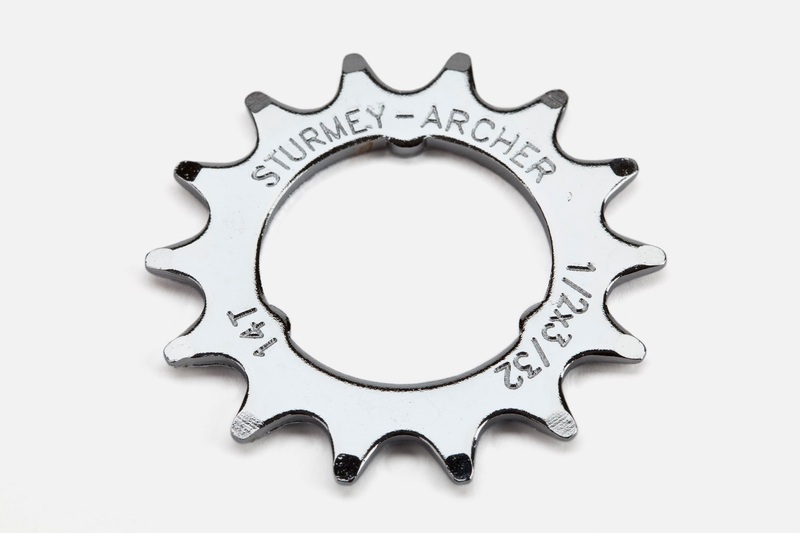 3 spline / ISO sprockets - as shown here, are used on the SRAM 3 and SRAM 6 speed rear wheels, and on the Sturmey Archer 3 speed rear wheels. They are available available with 13 teeth (13T) - (standard on the 3 speed BSR - Brompton Standard Ratio rear wheel, and used on the Sachs/SRAM 3 and 6 speeds). 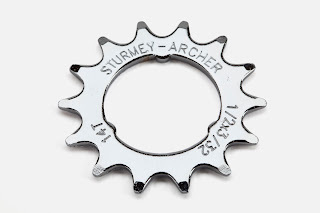 The 14T sprocket was a minor gearing option change for the Sturmey Archer rear wheels - but only in conjunction with a 1/8 inch chain - which is pretty much unused any longer. The 15T sprocket was used on the Sachs/SRAM 6 speed rear wheels along side the 13T. Shimano style splines, as shown here use 9 splines spaced so that the sprocket can not be put onto the hub the wrong way around. 12T - used on single speed Bromptons and in conjunction with the 16T on the two speed Brompton. 13T - used in conjunction with the 16T sprocket on the 6 speed BWR - Brompton Wide Ratio - equipped Brompton Sturmey Archer rear wheel. 16T - used in conjunction with the 12T on the 2 speed and the 13T on the BWR 6 speed rear wheel.